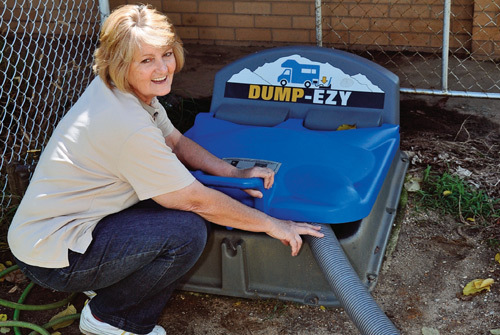 THE HUMBLE DUMP POINT is an essential staple of the RV lifestyle, and now that many councils and state governments are prohibiting the release of grey water onto the ground, they are set to become even more important. Yes, you read that correctly, no grey water on the ground. As long as we have been attending rallies and other RV events, grey water has gone to ground – with the council’s blessing. In fact, the often water starved grounds were usually left in better condition than when the RVs arrived. Last year’s CMCA rally in Port Macquarie, NSW, had things thrown into a spin when the council declared the grey water ban just before the rally started. With 1000 motorhomes expected on site, this quickly became a massive logistical problem for the organisers. We are telling you about this in the hope you will hop on the bandwagon and lobby your local council, or club, to work to install more dump points. Would you believe there are only 21 public dump points in the whole of Vic? Looking nationally, if you draw a line 100km inland from the coastal circumference of Australia, there is only one dump point for every 1350 sq km of that land. And rather staggeringly, there is only one every 37,500 sq km for the entire country. This shows the strife we could be in if too many councils take up the new regulations. Clubs such as the CMCA are spending more than $30,000 this year on dump points, while Kea Motorhomes is donating a large number of Dump Ezys. But much more needs to be done by the smaller clubs, and quickly. Dump-point use is currently free, but there is a disturbing trend in the US where they are charging $10 per dump at some public facilities. Many businesses are also seeing the chance to make a buck: a US truck stop chain recently announced it was installing (pay) dump points in all of its outlets. Essentially paying to use the bathroom takes some of the gloss off free camping, doesn’t it? Grey water comes from the kitchen sink, the bathroom and the shower/bath. It is relatively harmless if disposed of the same day it is made, but bacteria quickly builds up and it can become very smelly. Black water comes from the toilet and consists of human waste. It should never be disposed of on the ground unless a deep hole has been dug well away from any waterway. Anyone can join the 59,000-member CMCA, regardless of vehicle type, and get access to its password-protected website. The site has a special feature called Geo Wiki, which is essentially an easy-to-use database showing exactly where dump points are located around the country. It even provides you with a Google map. Camps Australia Wide also contains a very good list of dump points. The sixth edition has just been published, so it is very current. Many caravan parks have dump points, but you need to be very careful when using them (as explained below). There is nothing more frustrating than deciding to stay in a van park because you need to dump, and then finding you can’t. Many caravan parks list a dump point among their features. Indeed, they usually do have one, but is it easily useable? The most common form of dumping is via a cassette toilet, which can be carefully dumped in a sewer-connected hole in the ground. It is not as important if they are off the ground and surrounded by trees, etc., because you can walk the cassette to it. Water is also very handy for flushing, but in a pinch you can get away without using it. A huge number of fifth wheelers and larger motorhomes have what is called a black tank, which can be anything from 70L to 250L. These vehicles must be parked within 2m of the dump point, and the dump point itself must be lower than the outlet on the RV. This is because you-know-what won’t flow uphill. 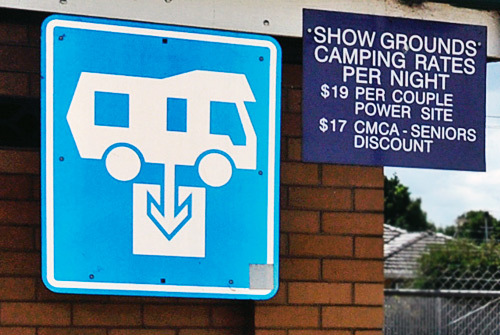 Sadly, there are hundreds of caravan park dump points that do not meet the basic requirements. The procedure for dumping is to let the black water go first, followed by the grey. Do not attempt to dump if your grey tanks are empty because you won’t be able to rinse the very large 90mm flexible hose, making for unpleasant storage. If you have a black tank you will already know that it is a pretty convenient system. You can go for at least 10 days without having to empty it. However, black tanks do have their problems, including sensor clog. You can minimise this problem by fitting a Tornado Permanent Washer, available from the US-based Camping World (www.campingworld.com) for $28. You connect this device to mains water and rinse the interior of the tank with sprayed water – great for getting junk off the walls. The washer also reduces odours and is very easy to set-up. Putting a cup of bleach in the grey water tank each day also helps to keeps odours down when you can’t empty daily. This is pretty simple: leave it cleaner than you found it. 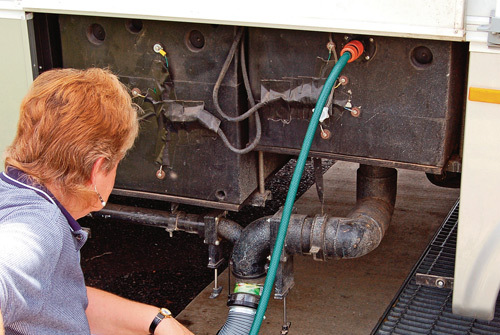 Many councils attach a small hose to each point, so it only takes a few seconds to rinse it out. Be aware that this water is often recycled, so it is a bad move to use it to fill your tanks. And never, ever use your drinking water hose to rinse anything to do with grey/black water. We won’t discuss the use of different chemicals here (it would double the size of the story). Black water tanks are the most tolerable to use because the tank is always vented through the roof. This means foul air does not waft up when you flush. You can get away without using chemicals, but you pay for it when you dump. The vacuum Dometic VT2500 emits minimal odours, but it is a bit noisy and you definitely don’t flush while still in the bathroom. The standard cassette toilet is good as long as you don’t sit there with the flap open. If you have a black tank, a macerator lets you dump into any public toilet using a 25mm sullage hose. This does get you some funny looks, though. You need to insert the macerator into the 76mm discharge line and run a sullage hose to a toilet or dump point. It gobbles up all the toilet paper and waste and turns it to liquid. Macerators are available from places such as Camec, Australian Motorhomes or Camping World (US) and cost between $199 and $500. Some marine toilets have them built-in, which is actually the cheapest way to get a macerator. But be aware that they can draw up to 25A.